If it weren’t for Pokémon Go, augmented reality might have stayed another forlorn futurist technology the public paid little attention to. Lenovo launches the first phone featuring Google's Tango design, offering Google an important test of whether consumers really want the technology. Tango's 3D sensors enable motion tracking, depth sensing, and the ability to measure areas. The Tango phone, which Lenovo announced in June, launches with 35 apps that utilize these capabilities. The 6.4-inch QHD display Phab 2 Pro features three rear cameras, including a 16-megapixel main shooter sandwiched between a fingerprint scanner below, and the paired depth sensor and motion-tracking fish-eye camera above. Instead, the AR mobile game from developer Niantic Labs, a former Google subsidiary, catapulted the technology to hundreds of millions of smartphone owners around the world. Now a few months after the game’s launch, the first fully capable AR smartphone has started shipping. It’s Lenovo’s Phab 2 Pro, and under the hood it contains the hardware and software neccesary to use Google’s Tango AR technology. Pokémon Go didn’t accelerate Tango’s consumer timeline, which has been in place since the team began discussions with Lenovo last year. "Actually I think Pokémon Go took everyone by surprise, including Niantic," Tango chief Johnny Lee, who spoke to members of the press at a roundtable event last week, says with a laugh. "Pokemon Go certainly made the conversation a lot easier with partners." Tango apps can be installed via the Tango app or Google Play and there are more than 35 of them available today, Justin Quimby, senior Tango product manager says in a blogpost. I tried a number of apps, all of which go live today on the Google Play Store, that were designed specifically for Lenovo’s Tango-equipped phone. There’s a Hot Wheels game made by Mattel that creates a virtual test track to send race cars down. Another game, Slingshot Island from developer Sockethead Games, plants a floating landmass in the middle of a room. You’re tasked with toppling structures on the island’s surface using a gyroscope-powered slingshot mechanic, much like Angry Birds. Jokes aside, Lee thinks the game proved the strength of AR, despite only using a rudimentary version of the tech. (Pokémon Go didn't map your surroundings. It just haphazardly plunked down a virtual creature square in the middle of the screen.) Niantic’s creation showed people how powerful an experience can be when you plant software in the real world and let people interact with one another. "It’s the idea that you can use physical space in a shared context," Lee adds. "The location-tracking capabilities of Tango can be the same vehicle for shared context between people." 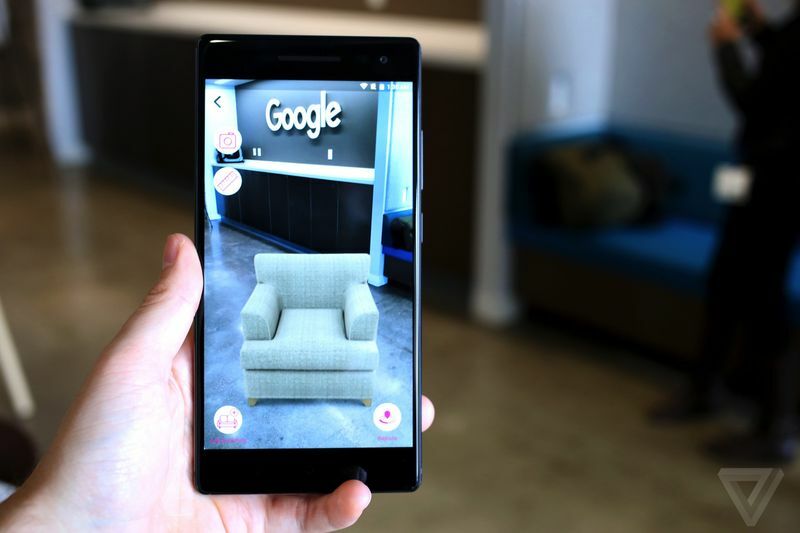 With the Phab 2 Pro, which is now selling for $499, Lenovo and Google are trying to prove that AR can and should become an integral component of modern smartphones. Lee thinks of Tango’s technology much like GPS, which transformed the utility of mobile phones and, years later, helped give birth to services like Uber. If AR is equally transformative in letting our devices understand physical spaces and "see" the world, it could help reshape entire industries, from gaming to retail to real estate. Until there's more devices out there with Tango tech — and thats not happening until next year, at least — this all feels very much like an experimental test phase for AR. But developers don't seem too discouraged. That's both because Pokémon Go proved there's an appetite for these type of mobile experiences, and Google is convinced it's only a matter of time before every phone makes the jump to 3D mapping. Google sees potential for the Tango design as a platform for all phones in future, and according to Quimby, the Phab 2 Pro will be joined by more Tango-enabled phones in early 2017.